One evening, Edge returned home to find his girlfriend in bed with another man. In a fit of rage and betrayal, Edge brutally attacked him. This landed him a prison sentence, and upon release, an unexpected restraining order from his girlfriend - despite having been led to believe that they would be together when he had finished serving time. Without support from his family, Edge had no one to turn to and nowhere to go. Soon after, Edge moved in with a new girlfriend. Their regular joints seemed harmless until one night, six weeks after they had started living together, when his girlfriend wasn't there to roll. Edge smoked a spliff and immediately felt weird. When his girlfriend returned, he found out why. Unbeknown to him, she had been lacing their joints with heroin and tonight, Edge had suffered his first withdrawal. Her deceit kickstarted an addiction which consumed his life for nine years. For much of this time, Edge was homeless. 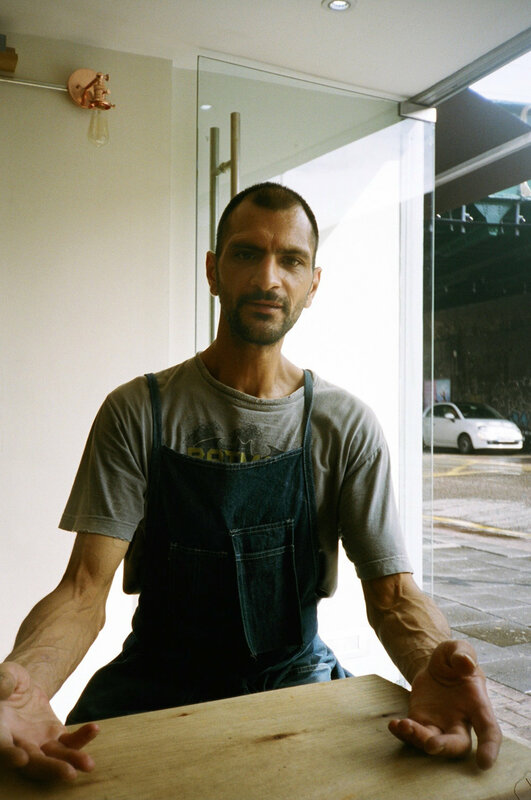 Spurred on by looking in the mirror one day, not recognising himself and thinking 'this isn't me and this won't be my story', Edge got clean without the help of a rehabilitation facility. He has now been sober for seven years. Testament to his incredible strength of character, Edge told me that he keeps himself clean by living above a heroin dealer. If he's ever having a bad day and contemplates blowing last month's salary on another rush, he just opens his window, looks down at the people waiting to score and instead, focuses on the prospect of next month's salary. Sobriety is a constant battle, but it's a war that Edge chooses to wage against. 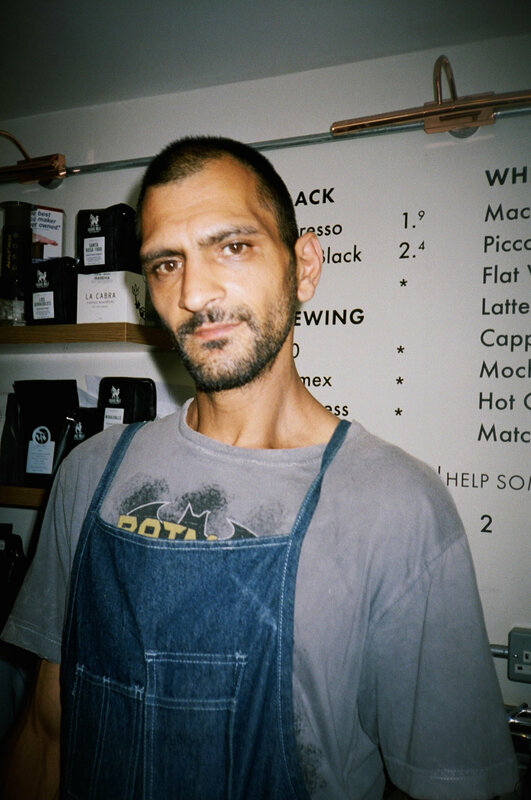 Second Shot Coffee gives a voice to the ex-homeless who work there as baristas, interacting with customers and co-workers alike, sharing their stories. Through 'Faces in Focus', I hope that people like Edge can keep being heard. 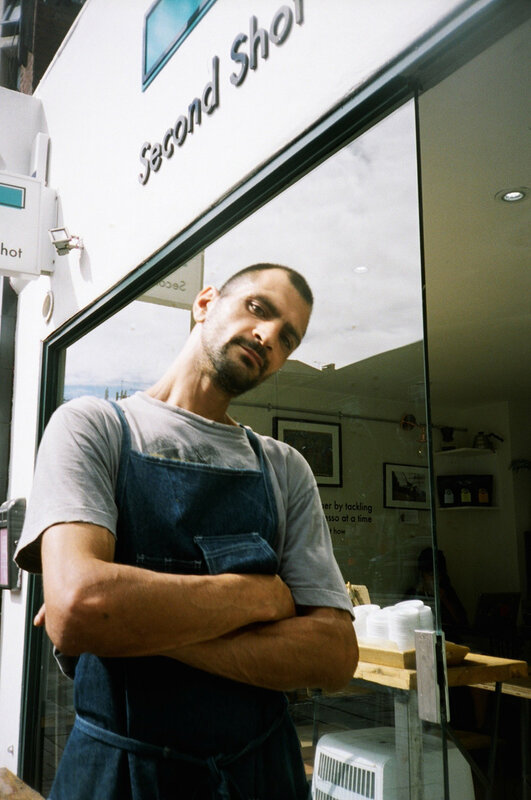 Ed Little photographs Edge in support of Second Shot Coffee, the East London Café that brings people together by tackling homelessness one espresso at a time. At Second Shot Coffee you can get incredible coffee, great food, and a unique atmosphere, and they just so happen to be changing lives. They employ people who have been affected by homelessness, train them as top quality baristas, before transitioning them on to past or preferred employment. They are committed to taking our staff from where they are to where they deserve to be. No one chooses to become homeless. A relationship breakdown, or losing your job, people that are homeless are victims of circumstance. They operate a 'pay it forward' system. This is where customers can pre pay for food and drink, and later someone in need can receive the goods free of charge. After regular opening hours, the cafe reopens as a hub for homelessness. They partner up with charities such as Finest Foundation, Providence Row Housing Association, and Who is Hussain to provide food drives, give out their 'pay it forwards', and provide advisory services to the homeless. To enquire about volunteering with Second Shot Coffee, please fill out the form below.